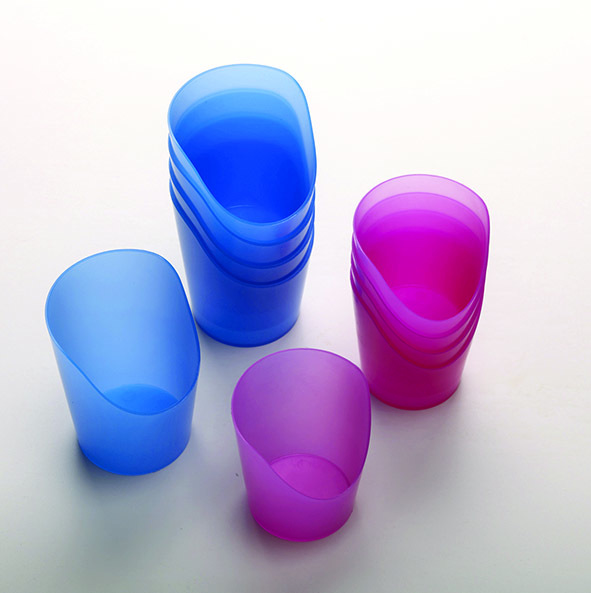 A set of 5 flexible plastic cups that can be used without tilting the head or neck. Available in blue & pink. These Flexi-Cut Cups are extremely useful in many different situations. Made from a flexible plastic, which when gently squeezed, will change the shape of the cup to suit your requirements. A cut out u-shape on one side means the cup can be tilted to a higher position without it spilling. It also fits perfectly around the drinker’s nose, meaning the head doesn’t need to be tilted back. This is great for anyone who has limited mobility in the head or neck. The Flexi-Cut Cup is dishwasher safe and contains no latex, lead, or phthalates. These cups are available in two different sizes – Blue & Pink. The blue cup has a capacity of 59 ml while the pink is slightly smaller at 29 ml. If you would like to talk to a member of our friendly team about any of our household products, please call us on 02392 255600. We’d be more than happy to help.